There has been a dark cloud looming over our home this week. We took Pokey to the veterinarian on Monday and the prognosis wasn't good. 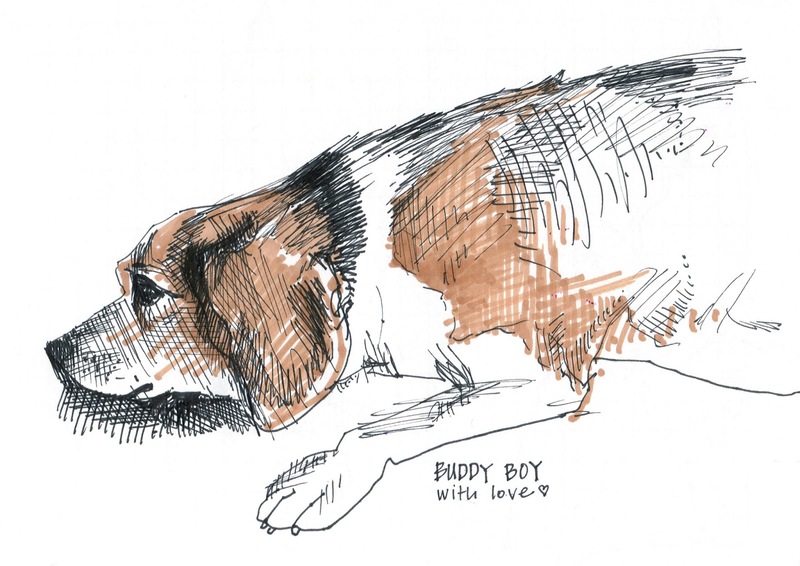 Over the course of 11 years [8 of which have been documented here] our beagle --'The Beagle'--has grown from the bargain pup we purchased at a flea market to the first animal I've ever truly loved to a constant companion, foot-warmer and muse. In recent years, he's willingly accepted a backseat to two energetic little boys, but has forever remained in the center of our hearts. This week, as we sadly accept the fact that he will not be with us much longer, I want to take a moment to pay tribute to our Buddy Boy. I've been looking back this morning over all the posts and drawings dedicated to Pokey and his antics. I hope you'll do me the honor of checking them out as well here. He's been such a character and tremendous source of inspiration over the years. Pokey, there will never be another who can replace you. You were with Edgar and I from the beginning and will be with us in spirit to the end. We love you. UPDATE : Sadly, we had to put Pokey to sleep on Thursday. He was a tremendous part of our family, and it will take us sometime to get past his absence. This is a touching, loving tribute to Pokey... my heart goes out to you and your family. I know how hard it is to face this decision. I hope you're all sharing lots of comforting hugs today and in the coming weeks and months. Je comprends la peine que vous devez ressentir... Le 15 avril de l'année dernière j'ai vécu ce même drame... Nos amis à quatre pattes ont une place dans notre vie semblable à nos enfants... Leur vie est courte et lorsque le moment est venu, nous souffrons terriblement de les voir s'en aller. Je pense très fort à vous et laissez aller vos larmes... Elles sont nécessaires. Un gros bisou à vous. I am so sorry. I recently had to say goodbye to my precious kitty of 14 years and it was very hard, so I feel your pain. I used "Lap of Love" hospice and home euthanasia and I am so glad I did as it was so peaceful and the vet was wonderful. Please look them up if you are considering keeping Pokey at home as you say goodbye. Thank you all SO, SO much for your kind words. It's been a difficult week as we had to put Pokey to sleep last Thursday---but we also have many great memories that are easing the pain. Oh no! Oh this is terrible news. I am so sorry for this loss. We can see from the pictures what a wonderful boy he is. Reading this 3 months after the fact. So sorry. It's hard to lose a four legged friend.i still miss our dog.